July 15, 2015, 6:01 p.m.
Last week Republican presidential candidate Jeb Bush caused some controversy after he said that &apos;people need to work longer hours&apos;. Bush later clarified that he was referring to the number of workers who only work part-time despite wanting to work full-time, but Hillary Clinton latched onto the comments and attacked Bush for saying that American workers don&apos;t work hard enough. Both have some claim to the truth, as while 6.7 million Americans currently work part-time despite wanting a full-time job, Americans also work more than their counterparts in many other wealthy countries. 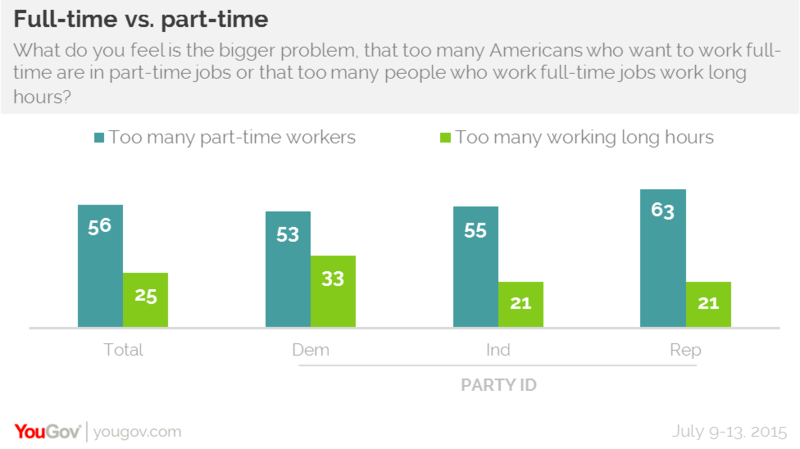 YouGov&apos;s latest research shows that most Americans (56%) think that the bigger problem is that there are so many part-time workers who want to work full-time. Only 25% of Americans think that it is more problematic that so many people who do work full-time have to put in unsocial hours. Most Democrats (53%) and Republicans (63%) agree that the dearth of full-time employment is a bigger issue. Many Americans (33%) do feel, however, that Americans work too much. 34% think that Americans work about the right amount while 21% think that Americans don&apos;t work enough. The attitude that Americans don&apos;t work enough is most common, perhaps ironically, among over-65s (74% of whome are retired). 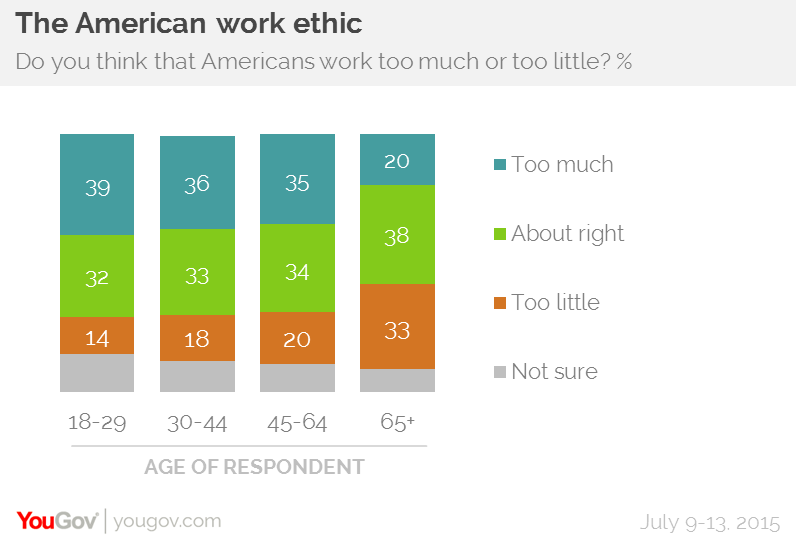 33% of over-65s think that Americans don&apos;t work enough, compared to only 14% of under-30s. 39% of under-30s say that Americans work too much. While Americans don&apos;t widely agree on whether people work too much or too little, a large majority (61%) agree that the average American worker is underpaid. Only 26% think that average workers are paid fairly while 4% think they are overpaid.